B.Sc. in Medical Imaging Technology is a 3- year course, divided into six semesters, each lasting a period of six months. The discipline involves the techniques and processes employed in creating images of human body parts for clinical purposes or in medical science. The basic eligibility criterion for this course is a Higher Secondary/ 10+2 qualification from a recognized educational Board. The average fee charged in India for pursuing this course ranges between INR 2 to 5 Lacs, depending upon the institute offering the course. Fresher graduates of the course earn anywhere between INR 3 to 10 Lacs annually, depending upon expertise in the field. They are hired in capacities such as Nuclear Medicine Technologist, Radiologic Technologist, Radiographers, X-Ray Technicians or Ultrasound Technicians, among others. The basic course highlights for B.Sc. 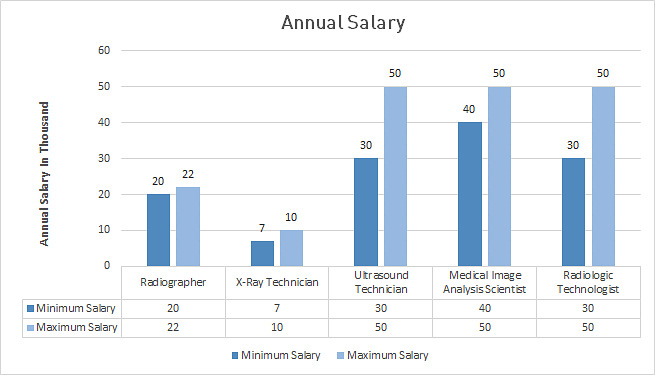 in Medical Imaging Technology are tabulated below. Top Recruiting Companies HLL Life Care Limited, South Eastern Coal Fields Limited (SECL), Steel Authority of India (SAIL), Employees State Insurance Corporation (ESIC) and many more. B.SC. in Medical Imaging Technology: What is it About? B.SC. in Medical Imaging Technology is a branch of Medical Research and Development, related to the study of various techniques of capturing images of human body parts for medical as well as research purposes. The course is designed with a diversified plan of study in advance imaging (MRI and CT), healthcare management and general knowledge about the discipline. B.Sc. in Medical Imaging Technology is suitable for candidates interested in expanding their prospects in the specialty of medical research and development. Ideal candidates would be proficient in time- management, adept at finishing tasks with speed and accuracy, handling stress, interpreting scientific/ technical data accurately, making analytic judgments, handling laboratory instruments, and operating computer systems. The course is ideally suited for candidates with an eye for detail, precision, self-sufficiency, self-motivation, and an ability to work within strenuous schedules. Listed in the table below are some of the institutes in the country offering B.SC. in Medical Imaging Technology, along with their respective locations and the fee charged by each. For admission to the course, candidates need to have qualified 10+2 from a recognized educational Board with a minimum aggregate score of 50% with Physics, Chemistry, and Biology as main subjects. The basic admission process in most institutes offering the course consists of an entrance examination conducted by the concerned university. However, many other institutes admit students solely on the basis of the score obtained at the 10+2 level, following which, a final round of counselling is carried out. A semester- wise breakup of the course is tabulated below. Note: In some universities, the course duration is extended to 4 years, with the 4th year essentially involving training. Successful Medical Imaging Technology graduates interested in higher studies in the discipline may choose to go for M.Sc., Ph.D. or M.Phil. in the subject, upon completion of which, such graduates become eligible for becoming scientists or assuming academic posts such as Lecturer in private/ government institutes. Successful graduates of the course, are capable of handling and executing assignments in hospitals and healthcare institutions, diagnostic centers and research laboratories.